Ellen Silberlicht with her sculpture Aladdin’s Garden. “The creative spirit is alive and well…and cannot be contained!” writes artist Ellen Silberlicht, expressing a sentiment that is evident in both her artwork and life. 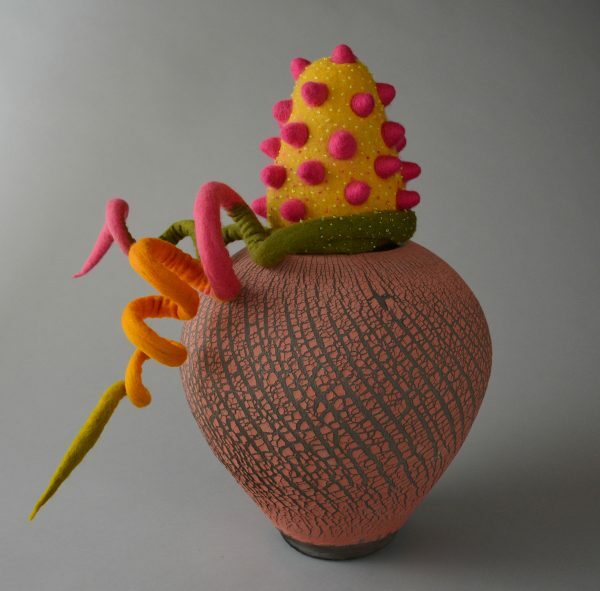 She creates stunning ceramic vessels burgeoning with exuberant forms in brilliantly colored felt. Her life has been a journey with twists and turns, replete with unique experiences—and always full of joy. The most transformative and life-changing experience happened in the summer of 2015, when she was diagnosed with breast cancer—and developed a unique new direction for her work. 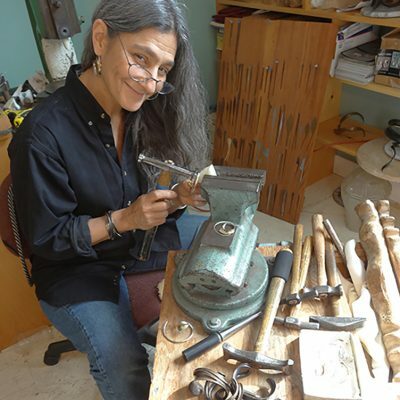 A maker at heart, Ellen has always had a passion for learning new things and exploring new materials. Growing up in rural Pennsylvania, Ellen was inspired to pursue art by her creative mother. Reading her mother’s copy of “Finding One’s Way with Clay” by Paulus Berensohn (which she says was “my bible”) helped solidify her desire to be an artist, specifically, a potter. 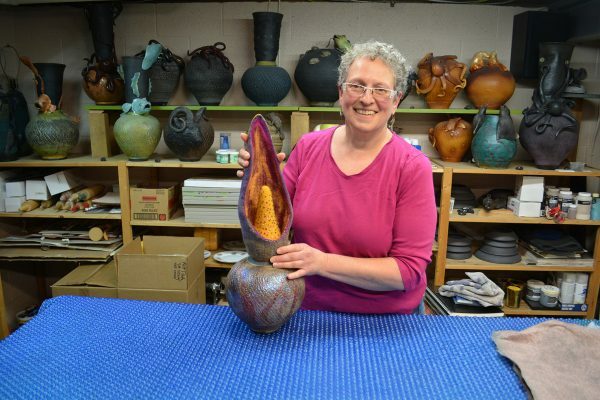 After getting her first taste of pottery at a summer class at Rhode Island School of Design in high school, she went on to receive a BFA in ceramics from The School for American Crafts at Rochester Institute of Technology. It was always her dream to be a self-supporting artist working in clay. Ellen Silberlicht with her sculpture in her studio. Ellen also grew up with a love of textiles and learned to sew at a young age. In an interesting twist along her path, she did become a self-supporting artist early in her career—but it was in textiles, not ceramics. She made a name for herself creating avant-garde vests, which she sold at shows like the American Craft Council show. Eventually, though, she began to feel more like a manufacturer than an artist, compelled to make the work her audience craved rather than being allowed to grow and evolve. When a friend mentioned a job opportunity for an art teacher, Ellen saw it as a chance to take on a new challenge—and it was a great choice. Eventually, she moved back to her hometown to be near her beau (now husband). She began teaching art at the very same high school that she had attended. And, though she had always said she would never move back home and never be a teacher, it turned out to be a wonderful thing. She loved being able to bring art to this rural community, and to open kids’ eyes and minds to new possibilities. Teaching also afforded her the chance to spend summers focusing on her own art, whether creating in her studio or taking workshops across the country. This allowed her to keep exploring new materials and to do what she loved with each one: pushing it as far as it could go. Instinctive Emergence by Ellen Silberlicht. Often, this interest in pushing materials had fruitful outcomes—though not always immediately apparent. 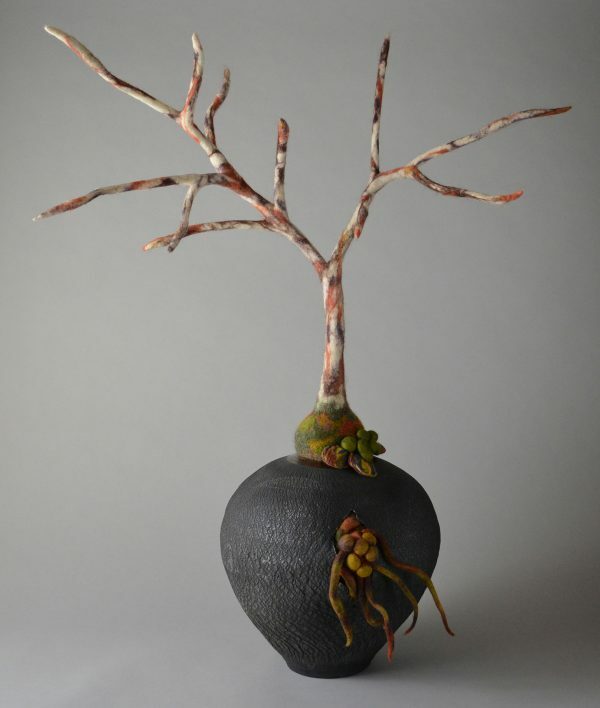 For example, she creates texture on her wheel-thrown vessels by pressing the walls from within. This stretches the clay, which sometimes causes it to tear. She explains with a chuckle that while a “normal” potter would just say “oh well” and toss the flawed piece in the reclaim bucket, she saw it as an interesting opportunity for something…though she didn’t know what. So she fired these torn pots and put them on a shelf to wait until she figured it out. The answer came to her during the summer of 2015. 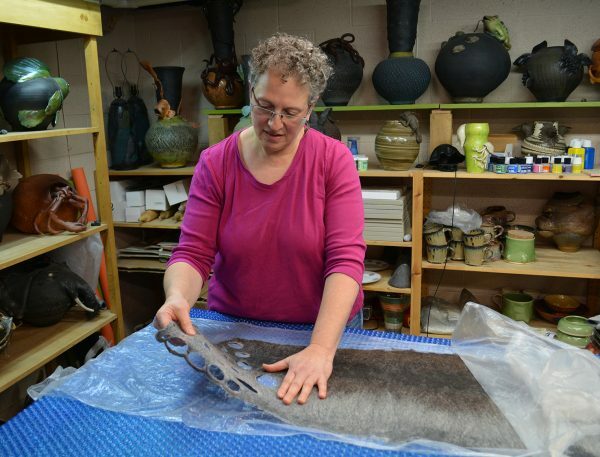 She spent much of that summer making dozens of raku-fired clay pots. She didn’t make lids for any of them, however. Typically, potters create pot and lid at the same time to ensure a good fit. For some reason, Ellen decided not to make the lids right away, even though she knew it would be agony later. It ended up working out in a way she could not have anticipated. In addition to working on ceramics that summer, she also took a sculptural felting workshop to feed her love of textiles. This workshop sparked a new idea for her art: she could fill the holes in her torn pots with felt! She was excited about this concept, but because school was about to start, she put it on the back burner and focused on preparing for the year ahead. Begin Again by Ellen Silberlicht. Then, just one week before school started, she was diagnosed with breast cancer. 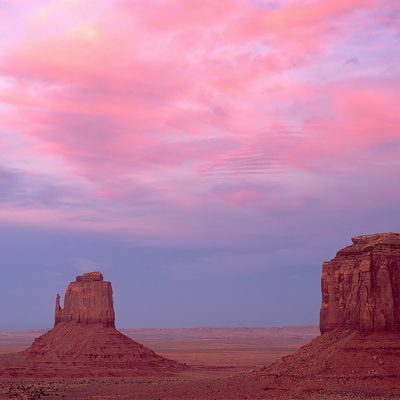 Ellen had lost her younger sister to breast cancer five years earlier. Her sister had been diagnosed with stage four cancer in 2004, and after years of fighting, lost her battle in 2010. Ellen’s first thought when she received her diagnosis was that she would be just like her sister. That there was a long, painful road ahead. That life as she knew it was over. But after just a few days of thinking this way, she had a realization. She realized that this was her life, not her sister’s. That treatment had come a long way. That her cancer was caught early. She was determined that things were going to be different for her. She decided to take a year-long sabbatical from teaching to focus on her health. A close friend of hers, Elaine, encouraged her to get treatment at a top-notch facility two hours away in New Jersey. Every three weeks for the entire year, Elaine drove Ellen to her appointments. At one point, a hospital volunteer came to talk to her about complementary treatment options. With every treatment she listed—reiki, acupuncture, nutrition counselling, art therapy—Ellen realized she and Elaine already knew several people who could provide that for her. 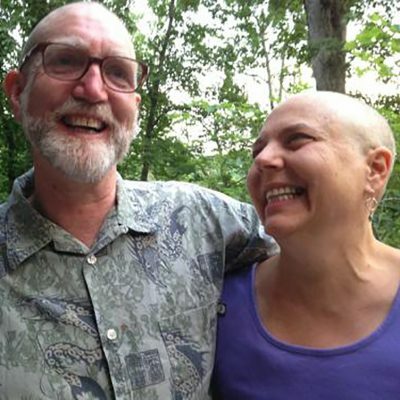 Ellen had an incredible system of supportive people around her—and she had the strength of her husband, her friend Elaine, and her art to get her through. And, remarkably, the effects of her treatment were never as bad for her as they were for many women she knew. A fellow teacher who had battled cancer warned her that there would be a few days out of every treatment cycle when she’d be sick on the couch all day…but that never happened for Ellen. At worst, she felt uncomfortable. But she was not in significant pain, and she felt well enough to keep making art. 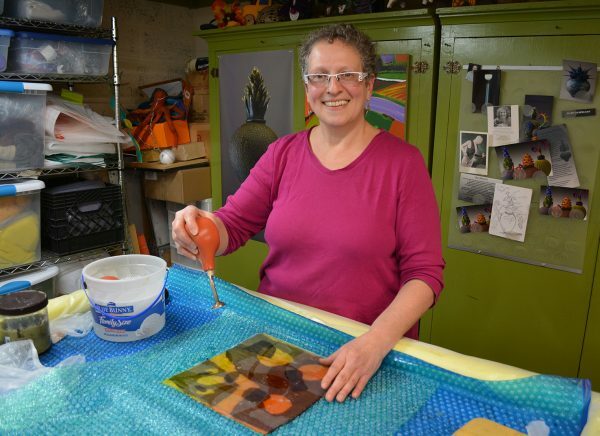 Ellen Silberlicht works on felting in her studio. However, she couldn’t work in clay, because of the potential for exposure to mold. What’s a potter to do? Ellen decided to focus on felt instead. She used what she had learned at her sculptural felting class that summer, and dove headlong into exploring everything that she could do with the material. 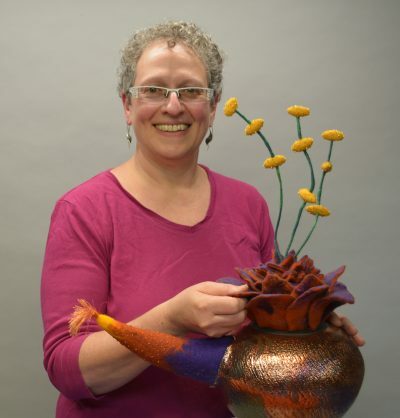 She was soon able to pursue the spark of inspiration she had that summer: combining felt with ceramics. 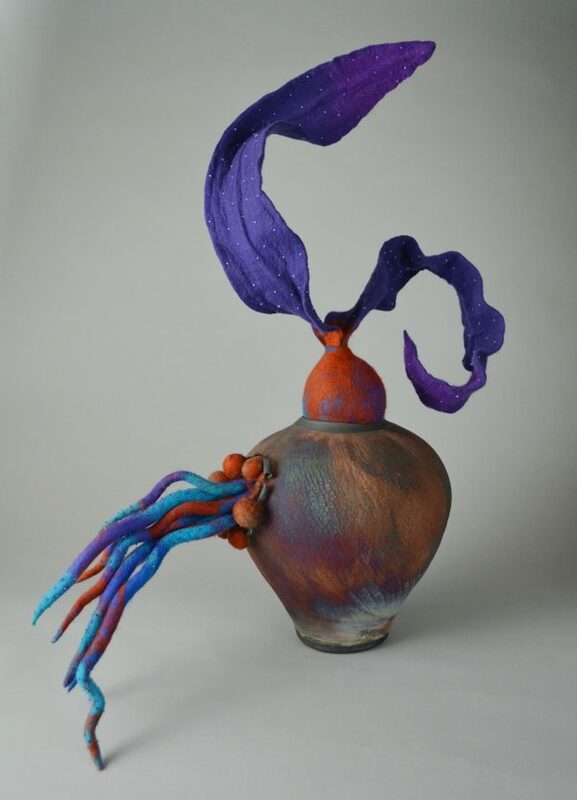 But it blossomed into something she had not anticipated: she found herself making felted objects that sprang out of the ceramic pieces in bold, unexpected ways, not only growing out of the tears in her pots, but also sprouting from the vessels’ openings, taking the place of the lids she never made. She ended up creating an entirely new body of work that married her twin passions in a way she had not previously imagined. Ellen Silberlicht contemplates what to do next with a piece of handmade felt. Eventually, she was thrilled to hear the news that she was cancer-free. Her life did not go the same way that her sister’s had. Ellen beat cancer. Once her sabbatical was over, she was faced with a choice: what would she do about this new body of work that had flourished in her hands over the past year? She could put it away, keeping it shelved behind the closed doors of her studio while she resumed teaching. Or, she could retire from teaching and put this artwork out into the world. She accepted the challenge: she chose the latter path. Joy-Filled Day by Ellen Silberlicht. Ellen believes that everyone who battles cancer goes through some kind of transformation. Her own transformative experience gave her an opportunity that changed her life for the better. If she hadn’t had that sabbatical, and if she hadn’t had to avoid clay, she may never have developed this unique new work and new direction for her life. Ellen Silberlicht’s ability to transform a difficult experience into something good speaks volumes about her positive attitude and strength, and to the incredible support of those around her. Ellen’s story is a truly remarkable one, and shows the power that can come when someone is able to turn a dire diagnosis on its head, to see a silver lining where one is not readily apparent, and to focus her energy on teasing out that silver lining to create something extraordinary and full of joy. Love you, Ellen. Your artwork is amazing! Thanks for sharing! HI Ellen, a wonderful story! You are a survivor who is thriving! As artists we experience healing through creating art. You do brilliant work Ellen, thanks for the story. So happy for you that your are dealing with your illness. Plus your creations are gorgeous. Keep the positivity going!!! I believe that helps in the spiritual and mental health. As artists we know our creativity heals.